The discussion about the new incarnation of Fistweaving is still raging across the forums. Some people argue that the talent (Rising Thunder) is too overpowered, and now the Developers have joined the discussion. Also, I’m getting closer to the Patreon deadline and wanted to show you a small sneak peek of the new UI! So much excitement! I must say, alpha has been way more fun than any beta I’ve ever participated in (actively or as a spectator). The developers go completely bananas with experimenting on abilities and talents, in a way they couldn’t have done in a closer-to-release beta environment. It’s really an opportunity to weigh in on the future of our classes. Legion Alpha Build – Minor Updates! This will be short and sweet guys, because Mistweavers were barely touched in this build. Considering that they shut down the alpha servers last night, just when I was about to stream alpha, I had hoped for something more. Can’t get it every time though. Hope’s up for next build! Soothing Mist is also triggered by Life Cocoon now. Fancy that, art for our Class Hall loading screen up and about already. Considering how long it took for Garrisons to get their own loading screens, I’m impressed. On the same note, equally glad that they were quick with the new icons for our core spells (Effuse, Vivify and Essence Font). Now I’m only hoping for a few more icons to our spells. The goal, I would say, is to have all our icons made for Monks. Some of our icons are from other classes (Mistwalk uses an icon that has been around forever). But that might just be my artistic side that craves more Monk icons. Possibly. Would you say new spell animations are too much to hope for? I guess it costs a lot of time and money to update them, and the current Legion spells use a patchwork of old animations that wouldn’t had been used otherwise (their previous spells were removed, *cough* uplift, zen sphere, chi wave for mistweavers, surging mist *cough*). I’d still like to see some new fancy ways to hurl jade on our allies’ faces. Variety has never hurt! What do you think? Posted on February 24, 2016 Categories Alpha, Legion2 Comments on Legion Alpha Build – Minor Updates! There has been said way to little about the new and revolutionary transmog system in Legion. As a transmog enthusiast, I simply cannot do nothing but to show you and expound on the subject. A whole new world has opened up for us, guys. Legion will be fabulous. Before I start with the nitty-gritty details of this lovely addition to our Collection tab, I’d like to summarize the new changes for those who haven’t caught up yet. Transmogging will be a new experience, take a look at the following. 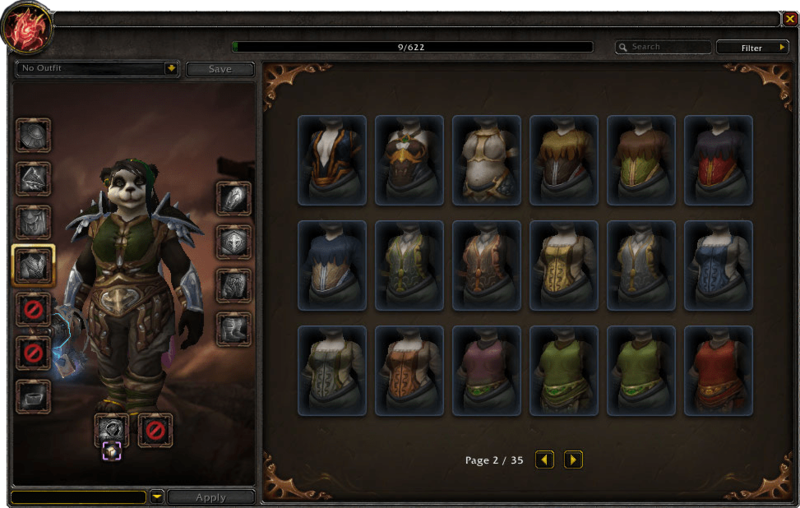 A whole UI dedicated for the Transmog Wardrobe, where you can browse transmoggable items you have collected and which you have yet to collect. Transmog will now be account-wide (normal gear restrictions still apply). Blizzard will retroactively unlock all outfits you ever have been rewarded through quests for you, even if you do not have the items anymore. New transmoggable slots: tabard, shirts and weapon enchants! You can now hide shoulders! By hovering over an outfit, you can see from where you can collect the item. A progress bar at the top of the window tells you how many transmog items you have collected. Transmogs sets is a new feature that allows you to save outfits. Outfits can be spec-specific, allowing you to transmog the same gear pieces to different looks depending on which spec is active. Currently, the Wardrobe can be viewed in your Collection tab, but you need to visit a Ethereal Transmogrifier to actually transmog. A new Alpha build has arrived this night (it’s always 4am my local time, dammit) and we’ve actually got some answers on the subject of our melee immunity status, which I just discussed as late as yesterday! A few minor changes to Mistweavers were also introduced, but nothing world-breaking. In this build there were tons of new models, Brewmasters finally got their artifact traits (looking rather fancy, if I do say so myself), and a myriad of tweaks and minor changes across the board. Mistweavers are relatively unchanged, but the feedback from the developer sure is an interesting read! Here we go! Renewing Mist heals for 500% of spell power, down from 750%. Rising Sun Kick now costs 2% of base mana, up from 1%. Spirit Tether (artifact trait) now reduces enemy’s movement speed with 20%, down from 30%. The new incarnation of fistweaving seems to have made its entrance to the Legion Alpha. Two new talents, entirely based around melee dpsing, have been introduced to the talent tree. After Blizzard’s removal of Crane stance, does this reversal mean Mistweavers are regaining some of its old flavor, or will we see an entirely new gameplay? Let’s start at the beginning. I never saw the birth of the Monk class, since I hadn’t come back to WoW until at the end of 5.3, something I sorely regret. I wish I could have experienced how the Monk class was at the very beginning – the notorious Jab-Jab-Uplift sequence seemed like a hell of a fun (not to mention broken). But I did experience the late-game of Mistweavers in Mists of Pandaria, when fistweaving was definitely a fun addition to an already quirky class. Since fistweaving wasn’t locked to a stance, Mistweavers transitioned more fluidly between healing and dps, without much of a pause in between. There was even a build called Lightningweaving, which was entirely built upon Crackling Jade Lightning as a Chi builder (though it required heck of a lot of spirit to compensate). But these were also the days when Mistweavers didn’t have much of a fan club since healing overall was entirely dominated by Disc priests (yes, even worse than now). If a raid absolutely had to have a second healer, it would likely go to the tree-huggers or the water-throwers. For those who have missed it – Blizzard has held a Legion Dungeon race between a European and American team. The two teams race through the dungeons Halls of Valor and the Maw of Souls. Interestingly enough for us, both teams sport a Mistweaver healer – we got to see plenty of Mistweaving action! The race is commented by Ion Hazzikostas (@WatcherDev) and Josh Allen (@CM_Lore) – I dearly recommend watching it! Posted on February 13, 2016 Categories Legion, MistweaverTags dungeon, Legion, raceLeave a comment on Legion Dungeon Race! I woke up this morning to see a bomb had dropped on Alpha – a newly deployed build containing so many new things! Dedicated blogger as I am, the first thing I do in the morning is to write about every little detail regarding Mistweavers. There are talent changes, artifact changes, a new artifact look, set bonuses, legendaries, and many more things. So, are you ready? Because here we go! Enveloping Mist has had a smaller tooltip change. New Spell: Reawaken. Resurrects all dead party members. Resuscitate only resurrects one player now and is available for all specs. Teachings of the Monastery now increases the damage of Rising Sun Kick or Blackout Kick with 30%, up from 20%. Crackling Jade Lightning now does 700% of Spell Power damage over 4 sec, up from 440%. New Talent: Rising Thunder. Rising Sun Kick resets the cooldown of Thunder Focus Tea. New Talent: Spirit of the Crane. Your Tiger Palm additionally causes your next Blackout Kick or Rising Sun Kick to restore 1% mana. Soothing Elegance has changed name to Mist Wrap. Now increases the duration of Enveloping Mist with 1 sec and the healing bonus with 20%, in addition to being able to channel Soothing Mist while moving. Summon Jade Serpent Statue is now a level 90 talent, changed from level 100 talent. The healing of Celestial Breath now has a 3 sec duration, down from 5 sec. The day has come for me to finally launch my very own Patreon! This is a big step forward, guys. I am super excited to share this, since it basically means I’m committing more seriously to the blog and the UI work I do. But first things first, I bet there are a lot of people who haven’t heard of Patreon yet – so I will explain what this is all about! Patreon is a site for creative people who need support. It allows people to donate to the creator on a monthly basis, and in return, the Patrons (the donators) will receive some awesome rewards by the creator as a thank you! Okay, donations, got it! But how much? You decide how much you want to donate on a monthly basis! You can decide on whichever amount you like. There will be different rewards depending on how you you donate, however. Tell me about the rewards! Posted on February 10, 2016 Categories Mistweaver, Patreon, WoWTags donate, Misty Teahouse, patreon, patron, supportLeave a comment on Teahouse Patreon is Launched!